Family owned and operated since 1999, the Book-A-Boat fleet includes the sleek Sea Hunt Triton Ultra and the Scout Sportfisherman, classic Boston Whalers, timeless Amesbury Sturdee Skiffs, and fun hard bottom Inflatables. We also offer Kayaks, Paddle Boards, Canoes, Sunfish and more. Choose from Hourly / Half Day / Full Day / Weekly / and longer rentals. Explore the waters from our Menemsha location and spend the day tooling around Menemsha , Quitsa, and Stonewall Ponds. Do a little fishing off Dogfish Bar, picnic at Picnic Point, or wander up the North Shore to the Brickyard - the entire Vineyard Sound is yours to explore! 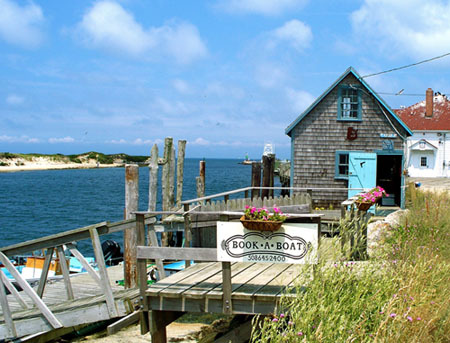 Visit us in Menemsha at BookABoat and have some fun on the water! worth doing as messing around in boats.